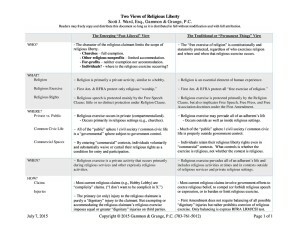 Religious Liberty Practice Group | Gammon & Grange, P.C. 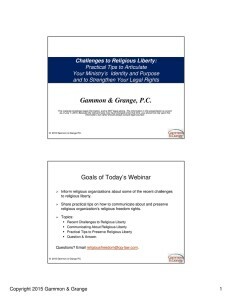 Gammon & Grange, P.C.’s Religious Liberty Practice Group has been advising religious organizations, churches, colleges and schools, and for-profit companies for over thirty five years to strengthen their religious liberties and more effectively carry out their religious missions. Recently, Gammon & Grange, P.C. 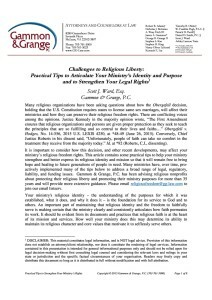 hosted a Webinar on Challenges to Religious Liberty: Practical Tips to Articulate Your Ministry’s Identity and Strengthen Your Legal Rights. To those who attended, thank you for joining us! We enjoyed the opportunity to share some practical advice with you. Gammon & Grange, P.C. will be sending additional information in the coming weeks about our work to protect religious liberty and to help you advance the ministry purposes and religious foundations of your organization. In the interim, please feel free to contact us if we can be of service to you at religiousfreedom@gg-law.com.